I’ve been using the original Paperwhite which I purchased back in fall 2012, and it’s proven to be an invaluable tool for my reading addictions. 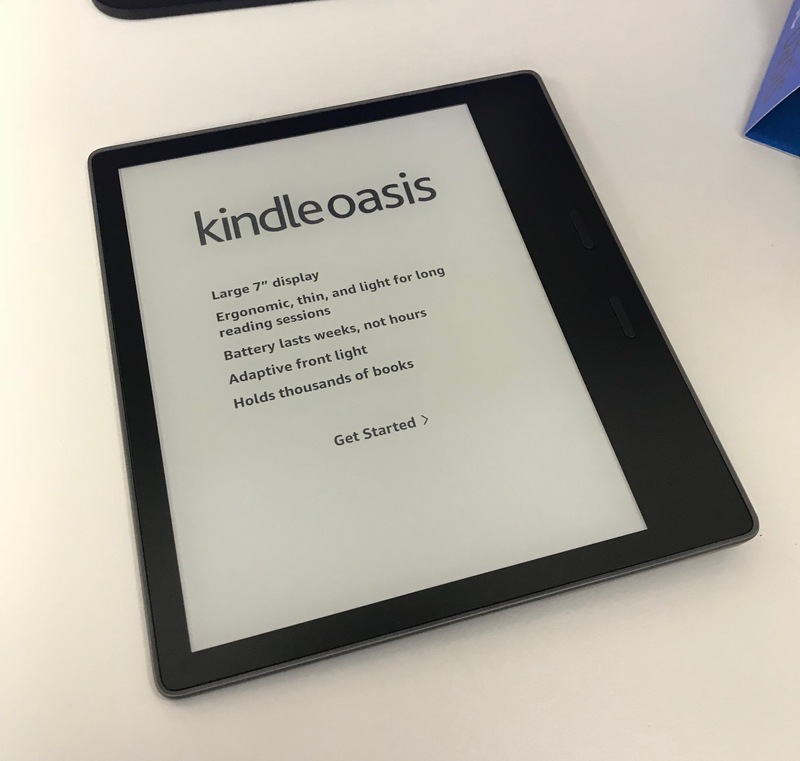 Over the next few years, Amazon have released a number of upgrades to the original Paperwhite, improving the contrast resolution and specs, as well as expanded the Kindle range with the likes of the Voyage and Oasis. The temptation to upgrade to one of these later models has been ever-present, yet I managed to move my cursor away from the “add to basket” icon on countless occasions. A few months ago, I dabbled over the thought of buying a Kindle Oasis for a while, but noticed that stock levels seemed to be scarce. This was not without reason, as I quickly became aware that a new revised update to the Oasis was on the way. Roll on to the 11th of October, and I received an email from Amazon, inviting me to preorder the all-new Kindle Oasis, thus confirming these rumours. ‘Now’ is the time to upgrade, I thought! I received my Kindle today on the 31st of October and it was on-time and well packaged. The box itself is compact, and very minimalist. Inside we have the brand-new Oasis itself, a charging cable and some documentation. So, what new features does the Kindle Oasis have over the original, and is it worth the upgrade, particularly if you’re coming from a 5 year old Kindle like me. Here’s what’s new. The design is significantly different from the original Paperwhite, which still retains the 2012 form-factor to this day. The bezel on the Oasis is flush with the screen, which is something I find a lot neater/modern. A unique aspect of the Oasis is the tapered edge and back. So basically, one side of the unit is thicker than the other side. I was initially sceptical about this, and in all honesty didn’t think that it looked particularly nice in the pictures. However, now that I have the Oasis in-hand, I can appreciate the benefits of this design. The Oasis is very comfortable to hold (at 194 grams), and the weight distribution along the thicker end ensures this, particularly for one-handed reading. This is also the first Kindle to feature an aluminium casing on the back. All previous iterations have had a form of plastic, which makes the new Oasis feel a lot more like a premium product. 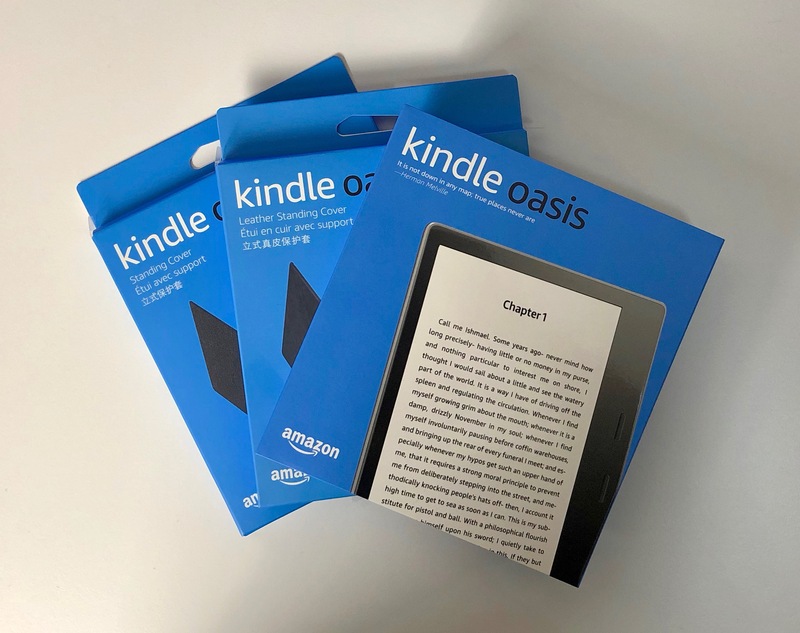 Compared with the Kindle Paperwhite, the Oasis also features two physical buttons on the side, which allow for page turns if you prefer not to tap on the screen. I should also point-out that the new Oasis is not a small device and won’t fit into your trouser pocket. It measures 15.9cm x 14.1cm, making it almost square in shape (something I’m not really a fan of). 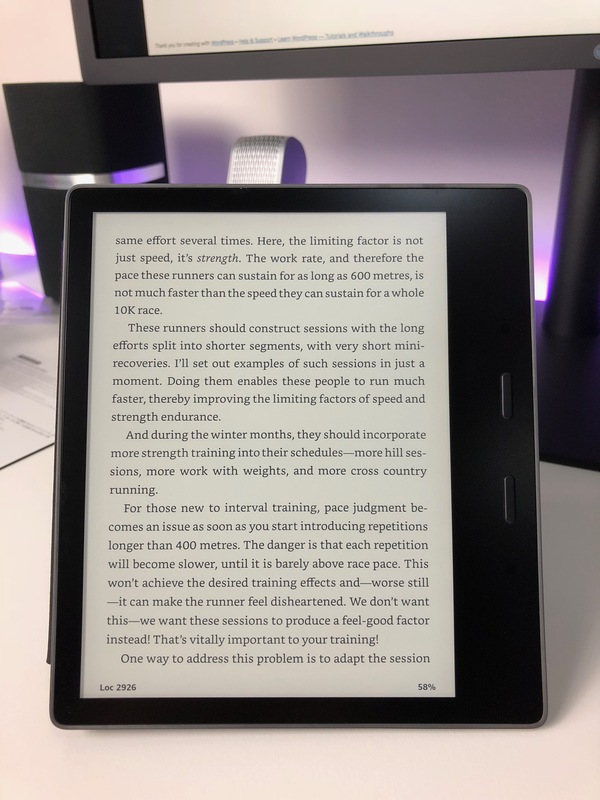 The original Kindle Oasis had a 6” display at a 300 ppi resolution. The size has now been increased to 7”, whilst the resolution remains the same. My Paperwhite from 2012, although crisp and sharp, has a lower resolution of 220 ppi. The backlight now also has 12 separate LEDs, which Amazon claim to be their brightest Kindle yet (although I would probably never use it on maximum brightness), which is ideal for the outdoors. The screen also changes the brightness using a technology called ‘adaptive lighting’, which was previously only available on the Kindle Voyage. This is arguably one of the most anticipated features of the Oasis, and judging by the name, is a feature which should have been present in the original. The new Oasis features an IPX8, which Amazon claims to mean that the device can be submerged in up to 2 metres, for up to 60 minutes. On all honesty, I’m not sure how many people will subject their Kindle to such depths and durations, but it is good to know that the device can withstand this! in For my personal usage, I haven’t yet used my Kindle in the pool or tub, however, this may now change. This is another feature that has been very much requested by Kindle fans. You can now listen to audiobooks from Audible directly from your Kindle Oasis! 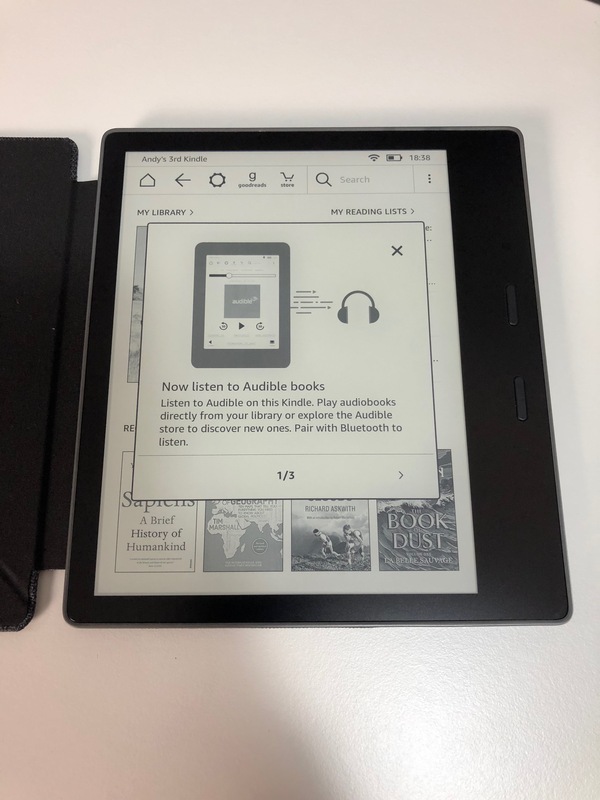 I suspect one of the reasons why this may not have been included before is due to hardware limitations; audiobooks can be very large in size, and to keep the cost of the Kindle as low as possible, means less storage. Then again, the bump from 4GB to 32GB shouldn’t be a significant cost. I opted for the 8GB version of the Oasis. The audiobook of Harry Potter and the Half-Blood Prince comes in at around 600mb. In comparison, written books are one a few kb in size. Even with the 32GB Oasis, storing any significant sized Audible collection could be a challenge. Fortunately, you can still stream from Audible. I personally will continue to use my mobile phone for my Audible books. The new Oasis is still a Kindle at heart. It still charges using the same micro-USB cable and has a very intuitive and easy to navigate OS. I personally love how text can be adjusted in both size and font, as well as tap jog and pressing on a word to find the definition and check Wikipedia. With the new Oasis, all of this is a lot faster than my original Paperwhite. It’s almost the same feeling as upgrading your mobile phone after a good few years! If you have ever used a Kindle before, you will feel right at home. On that note, I have to add that I very much enjoy the simplicity of the Kindle, as it allows me to detach myself from the ‘online’ world, whilst still being able to check definitions, Wikipedia and browse the books store. There is an experimental web browser, but it really is quite poor, and probably not even worth using. That’s no bad thing, as the Kindle is (at least for my use) a way to escape reality to some extent! There are a choice of two new cases available for the Oasis; a waterproof one, or a leather one. Both seem to add the same amount of bulk (which is not much at all). They can be folded in such a way, to allow them to stand on your desk for hands-free reading. 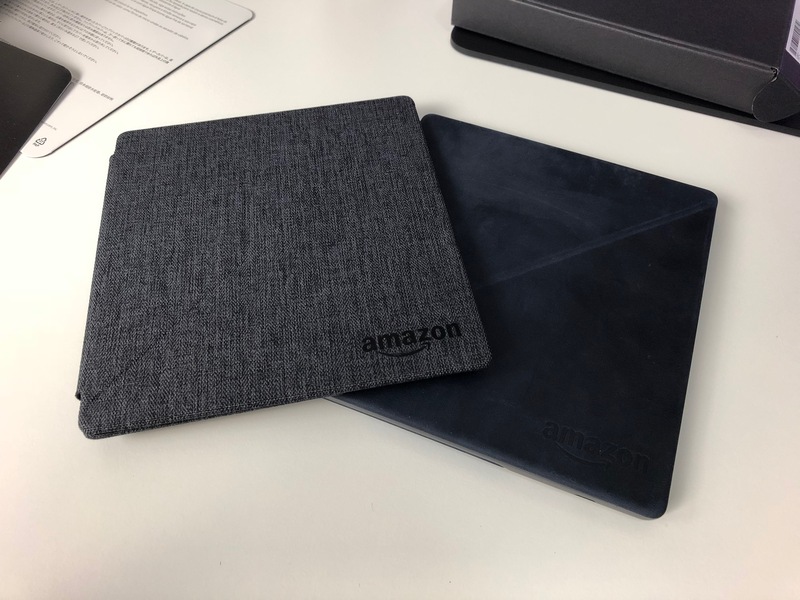 They both also operate in a similar manner to the iPad smart covers, where closing/opening the cover will turn the screen off and on, respectively. The leather case has an almost suede-like feel, can pick-up scratches, and will patinate over time. It also has a leather smell, so if that is undesirable, you may wish to look to the waterproof case, instead. The inner fabric protecting the screen is soft (and the same in both cases), but being black, does seem to attract some dust. Furthermore, both covers attach to the Kindle Oasis magnetically, and I found this to be very strong. The main gripes I have with the Kindle (and this goes across the entire range) is that there is still no colour e-ink display. The screen on the Oasis is amazing, and one of the best e-reader displays I have ever seen. Text is immensely crips and paper-like, however, there are a lot of pictures in e-books which come out looking odd as they are always in black/white. The other slight issue I have with he Oasis is the price. It is indeed a well-made and functional product, however, the high-price tag does take a little consideration, particularly when the less-expensive Kindle Voyage seems to offer a lot of similar features. I would have personally also liked the black bezel on the side to be a little slimmer. Conclusively, the new Kindle Oasis is a very welcome upgrade. Being waterproof and having a larger screen are arguably the biggest incentives to upgrade here over the original Oasis and other Kindle models. If you are coming from a much older Kindle (like myself), the upgrade will be much more apparent with the sharper screen and much better performance. But is it worth the upgrade? In my case, even buying the Kindle Voyage would have been a decent update, but I had waited a fair while and felt that the Oasis would better suit my requirements.